Jamie Heaslip in the depths of the Aviva Stadium yesterday. LIKE MOST LEINSTER players, Jamie Heaslip was more than a little shell-shocked in the immediate aftermath of Connacht’s stunning Pro12 final victory on Saturday. Along the post-match sideline, there was a row of white jerseys with thousand-yard stares as John Muldoon led Connacht’s delirium and claimed the prize for job that was perhaps done better than ever before. Yet Heaslip was one of a handful of Leinster players who made the difficult stop-off into a raucous dressing room to congratulate the men he knew best; current internationals and former Leinster players. Ultan Dillane wasn’t one of the backs slapped on Saturday, but Heaslip was placed square in front of one of Leinster’s chief tormentors when the lock was taken away from the Galway celebrations to launch a new Ireland jersey and a new four-year sponsorship deal. “I went into the changing room afterwards and I didn’t see him. 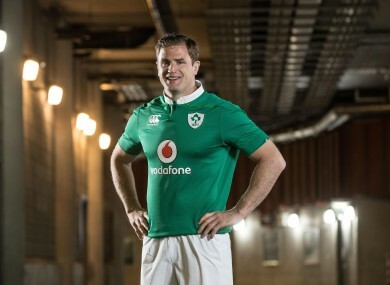 God knows what he was up to,” Heaslip says with a wry smile with the Aviva Stadium pitch behind him. “It was good to see him this morning and congratulate him in person. He was looking… a little bit tired. Cartwheels were about the only thing missing from the Connacht celebrations (as far as we know anyway). Dillane was good enough to spend a few free minutes on Monday treating Heaslip to some of the scenes of celebration out west. “He showed me some videos of the support he had,” Heaslip said with a disbelieving shake of the head. “They landed after 2am at Knock airport and he said there was like 3,000 people there. With a literal Ireland jersey on his back and a metaphorical Ireland hat on his head after Leinster’s season concluded in another Pro12 final defeat, Heaslip was asked if he could see the positives of having Connacht join the winner’s circle. The cartwheels weren’t immediate, but on thinking about the issue he began to warm to it a little. Email “Heaslip 'not doing cartwheels' for Connacht, but can see a very bright side for Irish rugby”. Feedback on “Heaslip 'not doing cartwheels' for Connacht, but can see a very bright side for Irish rugby”.